Get your twinkle on, it’s Christmas light time! Pour some hot cocoa in a travel mug, download your favorite holiday tunes and put your kids in the car–because I’ve got a list of St. Louis’ best Christmas light displays! Every year we celebrate the beginning of the holiday season with trip to a couple of these festive light shows. There’s something for everyone! Some shows are completely free and other will cost you by the carload. Check the details on your favorite display, because most of these offer special nights with walking tours, carriage rides, hay wagons and trains! If you start now, you might just see them all! It’s huge, it’s awesome, it’s all about the real Christmas story…and it’s free! OK, you should give them a donation on the way out, but you can pay what you can. If you donate $15 you can take home a Build-A-Bear plushy Cow for your kid’s nativity scene collection. The Way of Lights also has camel rides, a petting zoo and indoor activities. Camel & Pony rides are $6, food for the petting zoo critters is a buck. This freebie is becoming my family’s favorite light show! I know a glorified beer fest isn’t for every family, but you should seriously give it a whirl. The folks at A-B put on an awesome show–and the staff are always super friendly. Parents will appreciate the beer sampling, and you can buy the kid’s a couple s’mores to roast over an open fire while you warm up. You can ride a tram around the display or walk it. Make sure you stop by the historic Clydesdale stable to get a photo with a horse! 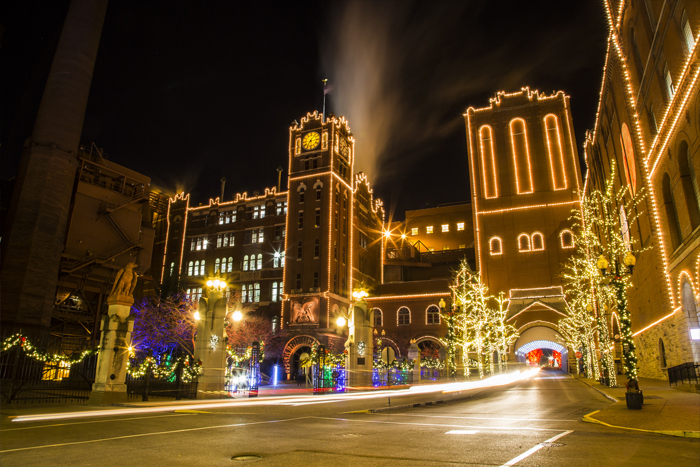 There’s an ice skating by the bottling plant, and you can take care of some holiday shopping for the beer lovers and St. Louis fans in the gift shop. This year they’re offering a Soup Bar to warm up the whole family! It’s open for walking on Thursday through Sunday, from 5:00-10:00 pm. Monday, Tuesday and Wednesday you can drive through the display, but there’s no activities. They’re lighting up the whole garden again, and boy, is it’s something to see! Lucky for us, they’ve also reduced the ticket price and added a Family Nights with $3 tickets for kids, and reduced prices on select Bargain Nights. Regular admission is $18 for adults and $10 for kids, and of course members get a discount. Check out the garden’s website for all the sparkly details. Bonus: your ticket includes the Garden Express Railroad! 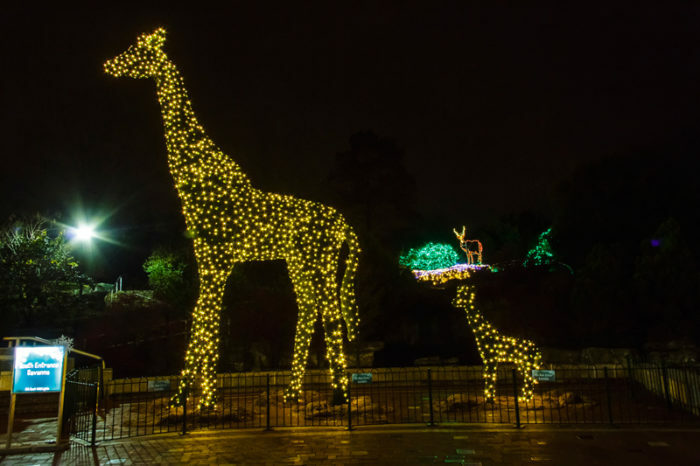 Bundle up the kiddos for a stroll through the St. Louis Zoo after dark! They’re open from 5:30 p.m. to 8:30 p.m. on select nights (check the calendar for details). Tickets are $8 for Zoo members and $9 for non-members on weekdays and $2 more on weekends. Children under two get in free. There is also free parking at both of the Zoo’s lots. Save time by getting your tickets online! The Penguins, Insectarium, and Carousel will be open during Wild Lights! Plus, the 4D Theater will be showing the Polar Express. New!! The Saint Louis Science Center will light up the indoor/outdoor GROW exhibit with cutting edge lights and explain the science behind holiday light displays. There will be demos and hands-on activities for the kids, plus you can pick up some cocoa, chili and s’mores. 5:30 to 8:30 pm. Tickets are $6 for members and $8 for non-members on the weekends, with a discount on Wed-Thursday. Free parking at the Oakland lot, the Forest Park entrance will be closed in the evening. This gem is run by the St. Louis County parks department. You can drive through, or ride in a horse drawn carriage! The Winter Wonderland is open daily from 5:30 p.m. to 9:30 p.m., except for Christmas Eve (they’ll be closed then). Cars are welcome Sunday through Friday, but Saturdays are reserved for carriage rides. Admission is $10 per family car (more for big vans and tour buses). Tickets for carriage rides are available through MetroTix, and vary depending on the size of the carriage. Cash only at the door for everyone else. More than 3 million lights have been strung through Rock Spring Park for their annual Christmas Wonderland lights display. 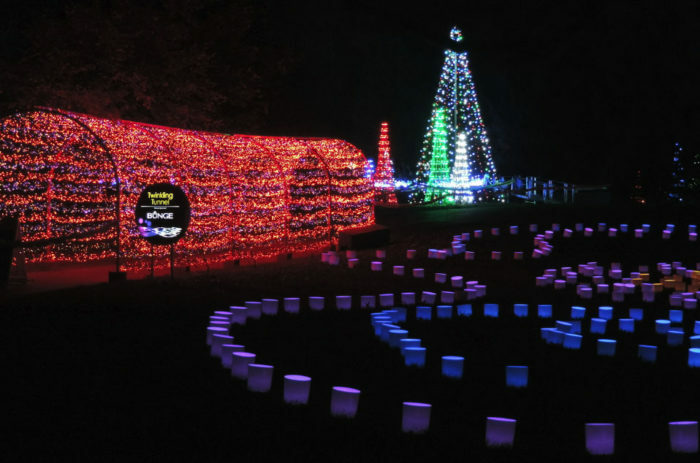 There’s cascading waterfalls, lighted trees and hundreds of light displays! Plus, kids can visit Santa in the Enchanted Forest until Christmas Eve. $7 per car. Open 7 days a week, from 6 to 9pm on weekdays and 5 to 9pm on the weekends. 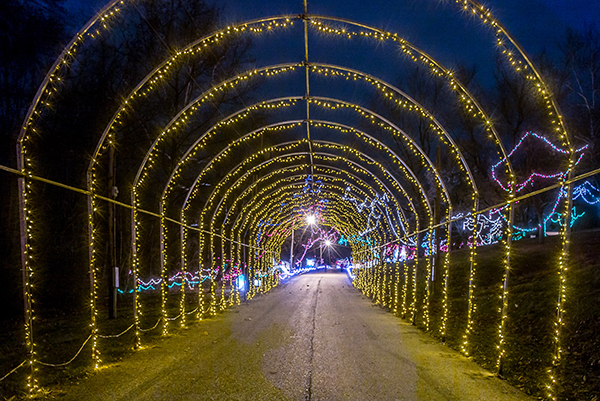 Drive through lights and holiday scenes set up in Fort Zumwalt Park. The display is open through Dec. 30, but closed on Christmas. Visit Sunday and Tuesday through Thursday from 6 to 9 pm, and Friday and Saturday from 6 to 10 pm. $10 per family vehicle. There’s a Tuesday Night Special – $7 for all non-commercial vehicles, and on Wednesday through Sunday, bring a food pantry donation of canned or boxed goods and get a $1 discount per vehicle. You can hop on a carriage, sleigh, hay wagon or train on select nights. Check out all the details here. There’s also a special walk-thru night on Dec. 5 from 5-8 pm. $3 per person in advance, $5 at the door. They’ve added even MORE lights to the millions of lights they’ve been stringing up in this converted campground! Ride a wagon or take your car. Runs 7 days a week (even on Christmas), admission is $23 per car or $13 per person if you take their wagon. You can visit Santa (and have a professional photo taken) in the gift shop. Candy Cane Lane is not an “official” light show, but a very festive neighborhood tradition in South St. Louis on the 6500 block of Murdoch. Nearly every house is lit up with twinkle lights and decorations, plus lights around the trees and streets. The block is located in the St. Louis Hills neighborhood between Ted Drewes and Francis Park–check out this slide show from the Riverfront Times! If you’re heading out to Boonville–maybe to visit a winery or Mizzou–then you’ll want to book a date for Warm Springs Ranch, home of the (baby) Clydesdales! You’ll need to RSVP for this event–it got a little crowded last year–and tickets are $10. Open 5-9 p.m., Thursdays to Sundays. 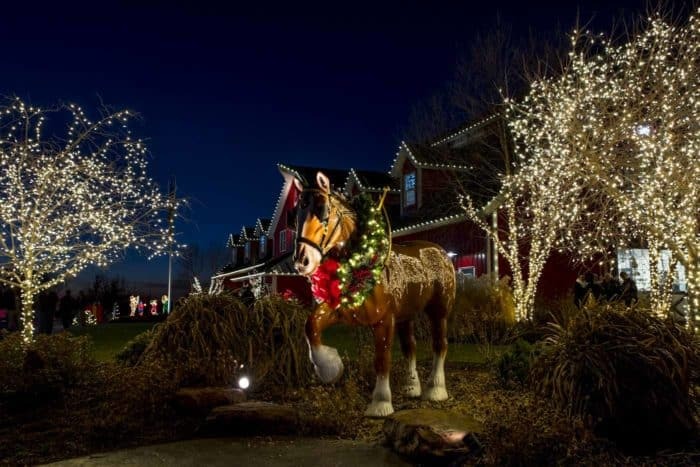 The ranch is decorated with thousands of lights, plus you can get a photo with a Budweiser Clydesdale, a tour of the facility, then purchase cider, hot chocolate and snacks. Adults over 21 will get tokens for two complimentary Budweiser beers. Last year’s new “Magic of Lights” didn’t catch on at the Gateway Motorsports Speedway in Belleville. Maybe they were too close to the Way of Lights? ?